Saturday 7th August – Never having been in an aircraft before, we were up bright and early packing the final bits of our luggage and laughing about what to have for breakfast in case we met it again during the flight. Porridge? No. Bacon and egg sandwich? Definitely not! We settled on 2 pieces of lightly buttered toast each. 11:30 am found us arriving at Perth Domestic Airport with our luggage, 2 sons, 2 girlfriends, 2 sets of parents and 1 interstate visitor in tow. We did not expect such a send off for an 8 day holiday, but it was our first time of flying so perhaps they were all there to see if our knees knocked together! We were fine. We had booked Qantas, the airline with the best safety record in the world, so I believe, and felt very happy with our choice. David and I checked our luggage in and got our boarding passes. It was very strange to be the ones leaving. We’ve been to the airport so many times, but always to see someone else off, so have come straight out again ourselves. 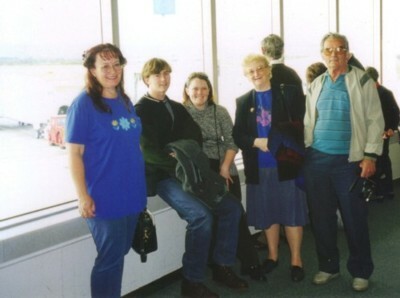 Then all of us were scanned for metal objects on the way upstairs, which was a surprise because we’ve never been ‘done’ at the International Airport. Maybe only the passengers get done there after they’ve said goodbye to those of us seeing them off? We went and looked out of the window at the plane next to Gate 2 and admired it. I took my travel sickness tablets as it was now ½ hour before boarding, and some photos were taken. Then… shock, the nice, reasonably sized plane that we’d been looking at out of the window left, and a smaller one came into its place. Hmm. Not quite sure what to make of this one and we both felt a little more nervous than we had looking at the large plane.. Amie said she liked the little spoiler on the back of this one. Not particularly reassuring. So we took more photos with the real plane in the background. Then for a coffee fix and the strange edginess of waiting for the unknown. Finally it was Time and we tried to race off before all the arms grabbed at us. Not a hope! Cuddles all round, a quick wave and we were off down the tunnel to adventure. “Hello” to the hostess – this is so strange. We found our seats and I sat next to the window confidently. The overhead compartment was only inches above my head, and the seat in front closer than I had expected. We were close to the back of the plane, but had only come a very few paces down the aisle from the front. There were 3 seats on our side of the aisle and 2 on the right of it. I kept saying “This is so small” and apparently David was getting worried as to how I was going to take it all. He thought I was getting claustrophobic although he knows I don’t suffer with that. I was actually just so surprised. I’ve only seen planes on films, and they’re always quite big. In fact they have leg room and the actors can stand up fully. If we stood up we had to hunch over so as not to hit our heads on the overhead compartments – and we are not tall. So one hostess checked that we all had our seatbelts on and then one started talking over the PA while number one made a stupid demonstration of what the other was saying. How embarrassing! While this was happening there was a clunk as the little tow-truck thingy hitched on to us and started to push us backwards. A little wave of dread swept over me, but fortunately kept going and was replaced by excitement and curiosity. David said later that he had felt the same way. Soon we started going forward under our own steam and I semi ignored the hostesses so that I wasn’t missing out on my adventure. They then finished and tied themselves down too, and we were taxiing along and then increasing speed. Wow! Faster and faster and being pushed back into our seats. I couldn’t tell you the exact moment when we left the ground, but I was looking out of the window and very gently the ground started to fall away. It was a wonderful feeling… to begin with. Haha isn’t it fun ~ I call it sitting in a sardine can LOL! We always say that we’re in ‘cattle class’. It sure feels that way doesn’t it? Glad you’re enjoying the story Gail. I felt so bad on that plane and swore I’d never do it again but look at us now 🙂 It was a big adventure and I’m so glad we finally flew.